Food delivery apps are making new inroads in Indian cities, as more and more Indians are opting to get food delivered. With many players and competitive discounts, India has truly gotten the taste of the convenience of ordering in food. Food delivery app Zomato has a nationwide presence in 63 cities across the country and if their recently revealed trends for FY19 are anything to go by, then tier 2 cities are leading the way in ordering food online. The report highlights how the food delivery app has penetrated to the smaller cities of India and has also revealed the eating habits and trends from these cities. However, a picture posted by the company's India Twitter handle and which has since gone viral, truly represents India's growing fondness for ordering food online. 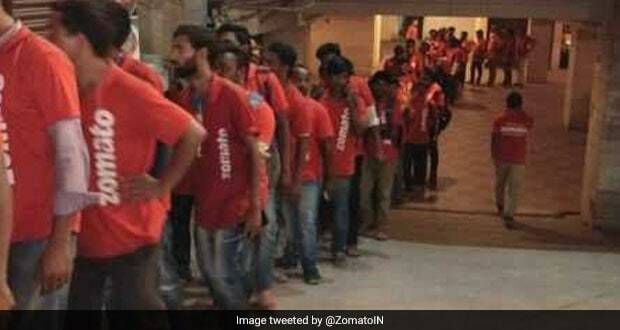 The picture posted by Zomato India two days ago, shows a very long queue of delivery executives or Zomato valets lining up outside one very famous restaurant in Hyderabad. Zomato posted the picture with the caption, "Which restaurant from your city deserves this kind of a queue?" The seemingly never-ending queue is a testimony to the popularity of the restaurant in the city. The restaurant that the delivery executives lined up outside is Bawarchi, which is famous for its biryani. The restaurant reportedly receives 2,000 orders every day and the picture depicts what delivery executive queues look like outside the restaurant on any given day. The restaurant, located at RTC crossroads, arguably serves the best biryani in Hyderabad. Zomato's annual report has some interesting facts about the food ordering habits of some other small cities in India. The report said that the app received more midnight food delivery requests from users in Indore than from users in Mumbai. Meanwhile, Vijayawada in Andhra Pradesh is a city that loves breakfast and Zomato is most likely to get breakfast delivery requests from users here. What do you order the most using food delivery apps? Let us know in the comments section below!